Bin Laden ‘tape’ is back! As usual, the new Bin Laden audio-tape is also aired by Al-Jazeera, based in Qatar, the most American friendly Arab state. As the previous Bin Laden tapes, this one also originated in Pakistan, which has four modern TV stations, but it had to be aired by Al-Jazeera. 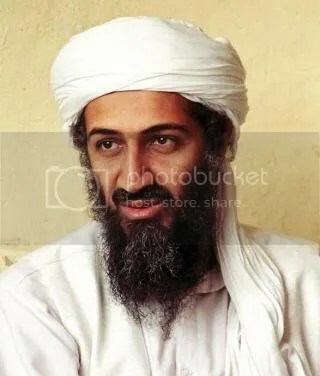 In this new tape, though Bin Laden warned his ‘half-Muslim brother’, Barack Hussein Obama, not to act an Israeli poodle, he also helped Obama’s anti-Muslim rhetoric by taking the credit for Mossad-CIA false-flag Nigerian terrorist operation at Detroit on Christmas 2009. How this phoney tape would serve Israeli interests – was obvious by the “very real” threat warning given a few hours after the new tape was aired – by British ZOG (other Zog countries include the US, France, Germany, Australia, Israel and Canada) foreign secretary David Miliband (son of a Polish Jewish communist Ralph Miliband). During first year Barack Obama has been in the White House, there have been more ‘terrorist’ incidents than while Bush lived in that building. To count a few; a Zionist pasty at Fort Hood and the 9/11 past Khalid Sheikh Mohammed and how the THREE (Tareq, his wife Michaele Salahis and Carlos Allen) uninvited guest who fooled the world’s greatest security netwaork at the White House during Obama’s dinner to the visiting Indian prime minister on November 24, 2009. Could it be a ‘drill’ to show in future how a terrorist, most probably a Muslim pasty, got passed through the presidential security network to harm Barack Obama? Since the Christmas Muslim terrorist false-flag operation – more and more American and Canadian airports are going under ‘Israelfication’ – which would make a 9/11 B2 more plausible. The Chief of US Homeland Security Department, Janet Nepolitano (a Zionist shill and reputed to be lesbian), has just toured various European capitals to establish a united plan to fight terrorism at the airports. Incidently, many of European airports already use Israeli ‘naked to butts’ sensors. These false-flag operations are intended to create fear and Islamophobia among the people and could mean setting the future 9/11B2. According to American author, educator and attorney Jeff Gates (watch three videos at the bottom in which Jeff Gates exposes Israeli terrorism) it could be the Israeli planned assassination of Barack Obama by some Muslim pasty, most probably from Pakistan. Israeli Mossad targeted former US president John F. Kennedy when he ignored Israeli prime minister David Ben Gurion’s requst to help Israel to become a nuclear power. “To assassinate an American president with impunity requires pre-staging. For Israel to succeed would require an Evil Doer on whom the deed could plausibly be blamed. The emerging fact patterns suggest that such pre-staging is well underway and that a Pakistani could be the perceived culprit. The recent history of Evil Doer branding offers insight into what to expect,” wrote Jeff Gates. Similar to 9/11 run-up propaganda – pre-staging is underway in the U.S as manipulated impressions become the mental building blocks to create a plausible culprit from an Islamic nation. Keep in mind that repeated reports of Iraqi WMD created a generally accepted “consensus” truth – regardless of the facts. Should pro-Israeli extremists detect an inclination by Barack Obama to endorse a return of Palestinian land to the Palestinians, the likelihood of his assassination will greatly increase. For his death to appear plausibly due to an Islamic source requires pre-staging akin to what is now ongoing. To displace facts with what the public can be induced to believe requires a period of mental preparation in order to make misdirection believable. So long as Barack Obama continues to serve Israeli interests, he will continue to live a charmed life. Should he hint that justice—say for the Palestinians—is a worthy goal, the pre-staging is in place to eliminate that threat. Likewise should he seek to shut down the ongoing oligarch-ization of America and the steady piling on of disabling debt. When RFK was murdered in June 1968, the gunman was Palestinian. That lesson should not be lost on Pakistan. In dealing with Washington, Islamabad should also recall Senator Fulbright’s candid assessment in 1973: “Israel controls the U.S. Senate.” He was gone by 1974, thirty-five influence-imbedding years ago.